This Gender Review has shown that gender parity ensuring similar numbers of girls and boys are in school at all levels of education is a work in progress, especially when it comes to the higher levels of education and to adult literacy and learning outcomes. One recent advance favouring achievement of gender parity is the adoption of the parity index by the Inter-agency and Expert Group on Sustainable Development Goals Indicators, extending the index’s use beyond enrolment ratios to all education indicators, including learning outcomes. While improved coverage of parity indicators is an important step, data and evidence suggest the need for a more comprehensive set of indicators that document gender equality. Indeed, the Gender Review has also shown that gender equality in education remains ever elusive and thus must be monitored in the scope of SDG 4. Education for gender equality must be education of good quality that develops the knowledge and skills of all children,including the most marginalized, to support their agency and empowerment. Indicators therefore are required in six domains: a) systematic monitoring of gender norms, values and attitudes is needed, as well as b) improved access to educational opportunities. Also crucial is c) the promotion of gender equality by institutions outside the education system, through d) laws and policies in education systems, e) targeted resource distribution and f) better teaching and learning practice(Unterhalter, 2015). Strong advocacy is needed for a measurement framework and a set of indicators that can track gender equality across all six domains (Table 6). Improving understanding of practices inside the classroom is key and requires additional monitoring. More comprehensive data on gendered aspects of curricula, textbooks, assessments and teacher education are needed. Consensus is also required on what aspects of gender sensitivity in teaching practice should be included in classroom observation tools. Such efforts would benefit from being embedded within the framework of gender-responsive sector planning, as in the recent collaboration between the Global Partnership on Education and the United Nations Girls’ Education Initiative (UNGEI). 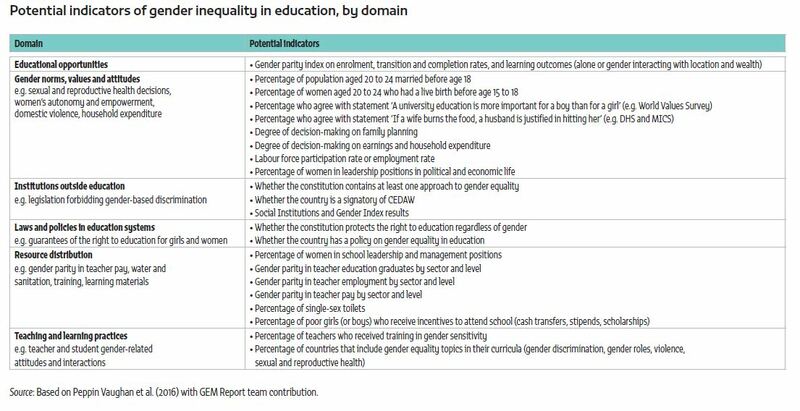 Since gender equality in education is so closely related to broader challenges of gender equality, closer links are needed between those working on indicators on gender equality in education and those focusing on broader indicators of gender equality (UN Women, 2015b). Wider dissemination of findings and discussion with international bodies concerned with women’s rights are needed. The Commission on the Status of Women would be an appropriate forum to discuss how to enhance links between SDG 5 and education reforms. To reach consensus on how best to measure substantive gender equality in education, and to establish a process for collaborating and sharing practice, a working group on measurement methodology – including UNESCO Institute for Statistics, UNGEI and UN Women – should be formed, as well as a transnational network allowing groups concerned with gender equality in education to share strategies related to global progress on measurement. Such networks have been successful on other issues, such as domestic violence and HIV. This Gender Review argues that achieving gender equality and empowering women and girls are integral– albeit challenging – facets of inclusive sustainable development, and that good quality education and lifelong learning are a crucial part of this process. They can equip people with capabilities and opportunities to participate fully and meaningfully in all dimensions of their lives – economic, political and social. But more than that, they can enable women and men, girls and boys to contribute to a society with greater equality. And yet achieving gender equality and sustainable development requires addressing deep-rooted, longstanding gender discrimination and unequal power relations, including in education. It requires adequate and dedicated financial and other resources, political will and support structures to develop synergy, and collaboration within and across sectors, including education, health and environment, to address crosscutting and intersectional issues. Structural barriers that women and girls face across all goals and targets need to be understood and addressed to ensure that all people benefit equally from all interventions (Rosche, 2016). Data collection, monitoring and evaluation systems related to measuring gender equality in education need to be scaled up and made more effective and comprehensive. Communities, societies and institutions need to develop networks, share best practices, plan interventions and mobilize local, regional, national and global action. The commitment of the 2030 Agenda to leave no one behind means that no SDG target can be met if gender equality and empowerment are not realized (Stuart and Woodroffe, 2016). Full integration of these issues in international development policy is long overdue. Creating a more inclusive, just and equitable world – the essence of sustainable development – means ensuring that all people, regardless of gender, can lead empowered and dignified lives.